A beachcomber on B.C. 's Haida Gwaii islands has discovered what may be the first piece of debris from the Japanese tsunami to arrive in Canada. A beachcomber on British Columbia's Haida Gwaii islands has discovered what may be the first piece of debris from the Japanese tsunami to arrive in Canada. Peter Mark was riding his ATV, exploring an isolated beach on Graham Island on April 18, when he made a spectacular find. "You just never know what you're going to stumble upon when you go for a drive, and lo and behold you just come across something that's out of this world," he said. Mark found a large white cube, like the back part of a moving truck, just below the high tide mark. "The door was ripped off it and I could see a motorcycle tire sticking out," he said. "So I went closer and looked inside and saw a Harley-Davidson motorcycle." 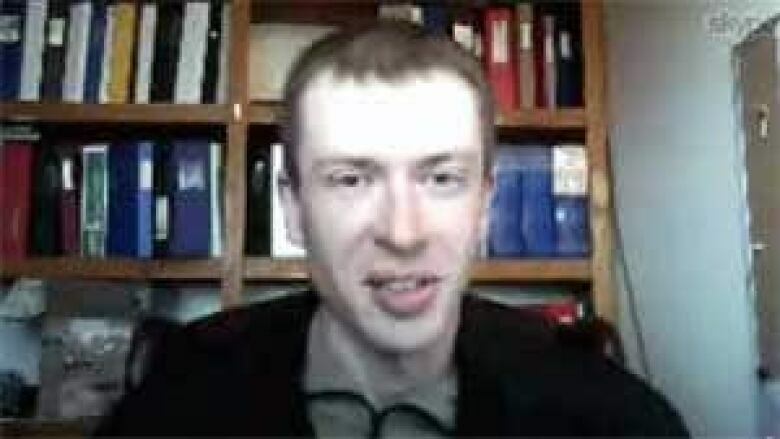 "First I thought, this has got to be the craziest thing anyone has ever found," he said. "Then I looked a little closer and the licence had Japanese writing on it. The wall of the trailer had Japanese print on the tags. And the first thing that popped into my head was this is likely from the Tsunami in Japan." 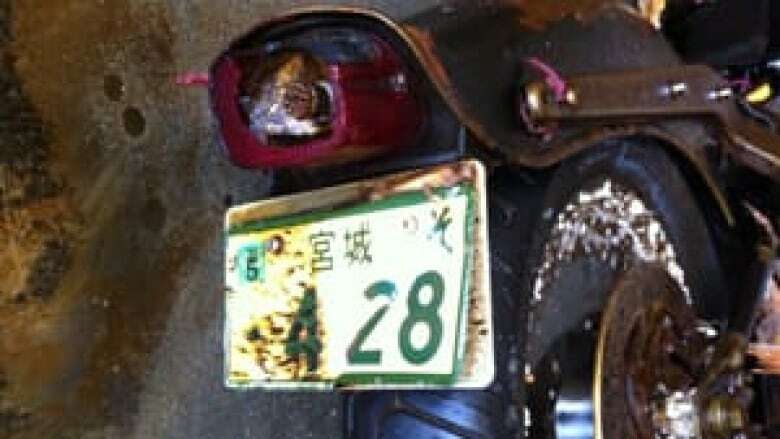 The motorcycle's licence plate shows it was registered in Miyagi Prefecture, and writing on the container matches photos of a commonly used Japanese moving van. Mark also found a few golf clubs, tools and camping equipment in the container. "It defies all logic," he said. "I cannot for the life of me figure out how that stuff stayed in there. The motorcycle was not strapped down. Everything was just laying loose on the bottom of the floor." Miyagi Prefecture was the worst hit part of Japan, with more than 11,000 people dead and missing. Video taken at the time of the tsunami shows numerous white trucks, similar to the cube that washed up on Haida Gwaii, getting washed away. Mark said seeing someone's possessions wash up on a beach 5,000 kilometres away was incredibly sobering. "I gotta say, the first thing that popped into my mind when I was looking at the scene [was] I really wonder what happened to this person. I really hope this person is OK," he said. "It's quite a shock to actually see it and to actually walk into it … [It's] quite an eerie feeling, knowing what happened to Japan and to those people. It kind of hits home quite a bit." The beach where the motorcycle washed up is remote — getting there requires an off-road vehicle and crossing several rivers — which is partly why Mark left everything where he found it. "I think the most important thing is that people treat the things they find with respect," he said. "These are parts of people's lives. Some people lost everything in the disaster, and I think people have to keep that in mind when they make a find like this." The Japanese consulate in Vancouver has the licence plate number and is trying to determine who owned the items — and whether that person is still alive. "In many cases, I believe the original owners will welcome reuniting with their lost objects," said Hideki Ito, Japan's consul general in Vancouver. Ito expects discoveries of personal items in the debris will be extremely rare, as most larger items will sink.